Carntions, the flower of pure love and good luck and they last FOREVER! We designed this especially with all of you carnations lovers in mind! 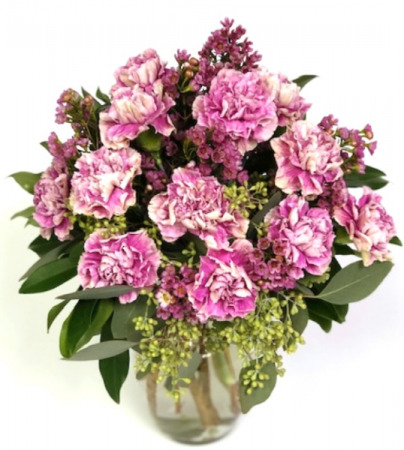 *Carnations are available in a variety of colours. If you need a specific colour please give us at least a week and a half of notice so we can order in what you need. Yum! Yum! Yum! For the eyes AND the tummy! 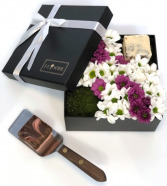 This beautiful arrangement comes with bright and beautiful flowers as well as two pieces of our very own gourmet buttercream fudge (made right here at Inspire Floral Boutique!) 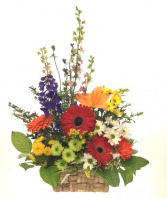 Flower Upgrades Include: Roses, Cymbidium Orchid, Ranunculus and much more. *Fudge Flavor Combinations: Chocolate/Vanilla Base (Chocolate Raspberry Swirl and Cookies and Cream shown) Chocolate/Chocolate Base Vanilla/Vanilla Base * Flavours vary and change with the seasons, but we guarantee fresh and delicious! ALLERGY ALERT: fudge is produced in a facility that uses nuts, dairy and gluten.